Join us for this introduction to the art of embroidery. Students will learn to embroider their MONOGRAM. Do you love label makers, carving your initials into the bark of trees, tagging freight trains? Well this is your chance to learn how to stitch your mark. 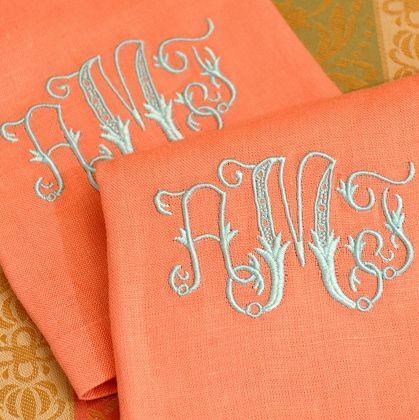 Put your name on it and make your linens and things FANCY!!! Topics include basic skills of choosing and preparing the fabric, using the hoop, and threading the needle, transfer techniques, anchoring stitches (to knot or plunge), to finishing the project for final display. Traditional embroidery stitches will be taught. With the skills learned, you will be able to continue making beautiful pieces of art or simply embellish items of your own. Visit our website to register online. Beginners welcome! Visit www.oilandcotton.com to register. I'm so sad that I missed this...if you schedule another one, I'm in!